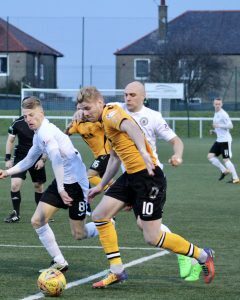 Annan could have few complaints after they suffered a narrow defeat at Ainslie Park against a City side who at one point were three goals up before Annan staged a late come back to make it an anxious ending for the home team. Annan boss Peter Murphy however would have been left frustrated at the manner in which his team conceded the goals in a match that was dominated by the strong windy conditions. Both teams were forced to make changes with El Alagui and Swinglehurst suspended, Hooper took the place of Swinglehurst at the centre of defence and Scott Shepherd replacing El Alagui up front for City. Edinburgh City playing down the slope in the first half made a promising start to the match against an Annan team who struggled against the elements. Josh Walker had the first clear opportunity in the 9th minute but the player failed to control the ball from a promising position. This was quickly followed by a Scott Shepherd effort which never really tested keeper Alex Mitchell. It came as no surprise however when City opened the scoring after a period of sustained pressure in the 15th minute. Ashley Grimes picked up the ball up from a situation that Annan will feel that they should have defended better but the finish was excellent. Grimes low 15 yard effort nestled into the corner of the net past the outstretched arm of Alex Mitchell. Annan were being forced to defend and Josh Walker was next to rifle in a shot. Annan were finding it difficult to muster any real challenge, Blair Henderson had Annan’s first attempt with a header in the 19th minute. The game then entered a period of stalemate until Edinburgh City doubled their lead in the 34th minute, once gain it was Ashley Grimes who made the breakthrough with an almost carbon copy of his earlier goal. Annan were certainly up against it and manager Peter Murphy made an earlier than usual substitution. Ayrton Sonkur was introduced at the centre of defence in order to push Scott Hooper into the middle of the park with Dan Orsi being substituted. The home team maintained their attacking momentum and in the 41st minute Josh Walker squandered a glorious opportunity when he latched on to a through ball to beat the offside trap and go clean through on goal but fortunately for Annan, Walker failed to take advantage of the situation. Grimes almost grabbed his hat trick when he headed narrowly past the post in the 43rd minute. Aidan Smith had a rare opportunity in the final minute of the half but his half hit shot was cleared off the goal line. Shaun Harrison was fortunate that the referee and the officials failed to spot his punch to the mid-rift of Rabin Omar which left the Annan player grounded. Annan playing with the elements in their favour started the second half with more purpose but they were once again undone after another lack of concentration when a long ball through ball caught Sonkur and Mitchell out and the uncertainty presented Scott Shepherd with the simple task of lobbing the ball into the empty net from the edge of the box to give his team a 3 goal advantage. Ashley Grimes and Peter Watson then faced up to each other resulting in a yellow card to both players. Annan were starting to push forward and Callum Antell pulled off an excellent save to deny Aidan Smith in the 60th minute. The City defence were proving resilient but they eventually capitulated when they conceded a penalty in the 70th minute after Blair Henderson was brought down by a rash Shaun Harrison challenge and Aidan Smith converted the spot kick although keeper Callum Antell took the sting out of the effort but could not stop the ball going over the line to give Annan a life line back into the match. City were holding on to their 2 goal advantage but in the 88th minute Patrick Scullion made a rare misjudgement after he failed to control the ball which spun off his foot and into the path of Blair Henderson who had the simple task of slipping the ball into the net. It was an anxious ending to the match for the home team but Annan did not do enough to deserve to get anything out of the match. EDINBURGH CITY – Callum Antell, Shaun Harrison, Joshua Walker, Marc Laird, Craig Thomson, Cameron Blues ,Ashey Grimes (Graham Taylor 76 min ), Liam Henderson, Scott Shepherd ( Callum Hall 74 min) ,Jesus Garcia Tena (Stuart Morrison),Patrick Scullion . Substitutes not used: Fraser Morton GK, Jordan Caddow, Calum Hall, Gareth Rodger, Kieran Watson . ANNAN ATHLETIC – Alex Mitchell, Jack Brannan, James Creaney, Evan Horne, Peter Watson, Scott Hooper, Dan Orsi ( Ayrton Sonkur 38 min), Rabin Omar, Aidan Smith, Blair Henderson, Ben Armour ( Connor O’Keefe 85 min). Substitutes not used Jim Atkinson (gk), Robbie Hogg, Peter Murphy, Kevin Rutkiewicz. Clyde caused the biggest problem of the day when a late goal from David Goodwilllie eased their relegation worries to lift the points and dent title Peterhead’s title hopes. Montrose maintained their position at the top of the table scoring twice in the last 15 minutes to overcome Stirling who went ahead in the first half. Elgin City moved back into the play off zone with a 2 goal victory over play off candidates Stenhousemuir. Berwick Rangers collected the points with a 3-1 victory over Cowdenbeath who remain firmly routed to the bottom of the table.